The limited edition New Nintendo 3DS XL Majora’s Mask bundle is available for pre-order in the UK over at Amazon UK. Be sure to get yours soon as they are certainly going to sell out very quickly. UPDATE: I pre-ordered a copy and I am having it sent to the United States. In doing so it dropped the price to 192.44 British Pounds, which comes in at less than $300 in US Dollars. Not terrible at all and I’m not sure why the price dropped. For those in the United States considering importing the console, it’s worth noting that the console is region locked. 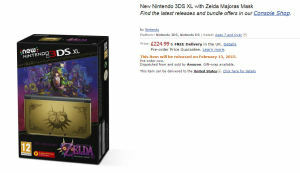 It also costs 224.99 British Pounds, which translates to about $340 US Dollars, plus the cost of shipping. However, it does include a copy of the game. So this looks like it’s a good deal for UK fans, but perhaps the greatest for US residents.